Our highly regarded Salaried School Direct programme is a rewarding route into teaching. The Salaried route offers hands-on classroom practice in two placement schools with ongoing training and professional learning sessions alongside, in order to provide a well-rounded route into teaching. You are employed by a school and paid a salary throughout the programme. As the SCITT programme allows me to train on the job, I am fortunate enough to be spending the school year with the same wonderful class. I find that this aspect is extremely helpful in progressing my teaching as it allows me to really get to know the children, plan my teaching to suit them, and track their progression throughout which in turn guides my planning. Having this opportunity for continuity has given me far more confidence in my own ability as I can see how far I have come since starting the programme and I firmly believe that this is a unique opportunity, not always possible in other training routes. On the Salaried programme you will be employed on a fixed term contract for 58 weeks which will run from June 2019 to the end of your training in July 2020. This covers the Summer Programme and the academic year from September to July. The Summer Programme is an intensive, supportive programme of professional training designed to develop your knowledge, understanding and classroom practice ready for September. The time during the summer programme is divided between training sessions and time in both placement schools to get to know staff and pupils. This is a compulsory part of the programme and therefore applicants must be able to attend from 17th June to 18th July inclusive. The Summer Programme cannot be combined with any other paid work, for example as a TA in a school, and so if you are currently employed you will need to arrange to finish your current contract in order to attend. From September Associate Teachers (trainees) on the Salaried Programme can have sole responsibility for up to 10 hours of teaching per week. This is where you will have the unique opportunity to build on the teacher toolkit, developed during the summer programme, with the support and guidance of your School-based Mentor and Senior Link. The amount of teaching that an individual Associate Teacher has sole responsibility for can increase from January, and this will take place once your Mentor and Programme Leader are satisfied that you are able to do so. Our Salaried Programme offers the opportunity to spend Wednesday mornings and some whole days in a second placement school. This is a unique experience to develop and embed practice in a contrasting school. Again, as with the main placement school you will be supported by an experienced Mentor and Senior Link. Our professional training is delivered by some of the best teachers in the county and will always incorporate research and theory as well as practical tips and advice. We have an incredible team of subject specialists that also provide tailored and specific sessions linked to your subject area. The Summer Programme begins on 17th June 2019 and is an intensive training period that provides you with the basic toolkit to be ‘classroom ready’ in September. This is a compulsory part of the programme, and as such you are contracted and paid from this point. The academic year begins in the first week of September, each week you will spend four days in your main placement school, a morning in your second placement school and an afternoon in professional training. This will be supplemented with additional subject knowledge training days throughout the year. 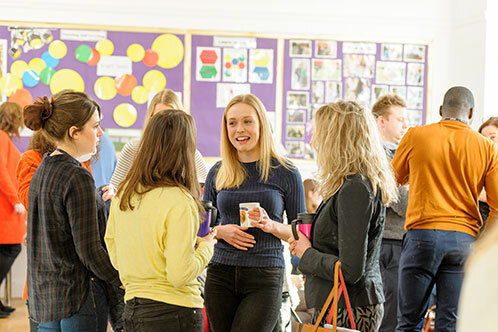 From September to December – In your main placement school you will have up to 10 hours of sole responsibility for teaching, with the remaining time spent on professional learning, team-teaching with your mentor, planning and preparing, observing other teachers and working on your evidence portfolio. From January your timetable can increase to up to 15 hours of sole responsibility teaching in your main placement school. The increase will be gradual and will be negotiated; the remaining time will still be used for your own professional learning. In your second placement you can now have one hour teaching with sole responsibility. Salaried Associate Teachers are paid and employed on a fixed term contract which will run from 17th June 2019 to the end of your training on 31st July 2020. This covers the Summer Programme, 2019 summer holidays and the academic year from September to July. The programme leads to the award of Qualified Teacher Status (QTS) but Salaried Associate teachers may also undertake the optional PGCE at a cost of £1,500. Please note that our primary programmes are available as either a 3-7 or 5-11 programme and our secondary programmes are either 11-16 or 14-19. These are the ages of the pupils you will gain the majority of your experience with and you will be required to meet the Teachers’ Standards within this age range. We are committed to providing interesting, flexible and varied experiences and so on our training programmes, you will also have opportunities to observe and experience teaching in other age ranges. Primary Associate Teachers for example, will spend some days in a secondary or special school setting and will have further opportunities to understand what teaching and learning at Key Stage 3 looks like, in order to best support their pupils in Key Stage 2. Similarly, secondary Associate Teachers will develop some understanding of primary schools and most will also have the option of some Key Stage 5 (A level) teaching and experience. * Design Technology – We generally place candidates in Food Technology, Textiles or Product Design but are open to applicants with skills and experiences across a variety disciplines or with a particular specialism. ** Modern Foreign Languages – We generally place candidates with a main language in French, Spanish or German. In addition to the main language we expect all of our Associate Teachers to develop a second language which will usually be from the same list. There is significant support available so that you can develop your expertise in the second language, including through nationally funded ‘Subject Knowledge Enhancement’ courses. This programme is suitable for applicants who want to specialise in the 3–7 age range. You can complete this course on either the tuition fee route or the salaried route. On this route, Associate Teachers take part in all the training available on the regular primary route but benefit from having additional sessions specific to the Early Years setting. On this programme, Associate Teachers have one placement in Early Years and one placement in KS1. It is a popular programme which is the perfect combination of theory and reflective practice across the 3 to 7 age range. For this programme we work closely with our excellent early years providers across the county and the additional sessions are run in various Early Years settings across the county. This programme is suitable for applicants on either the tuition fee or salaried programme who want to specialise in Special Educational Needs and Disabilities. On this programme, Associate Teachers will have one placement in a special school and one placement in a mainstream school (5 to 11 age range). Associate Teachers will take part in all the training available to the regular primary route but will benefit from having additional session on working with children with SEND in a special school setting. For this programme, we work closely with Outstanding special school providers such as Frank Wise Special School who deliver the additional enhanced training sessions. Please note, this programme is designed for applicants wishing to go on to work as a teacher in a special school as opposed to those who have a more general interest in SEND; all of our programmes benefit from expert training in various aspects of SEND education and teaching for all pupils.